at a debate in Alameda for state party chairship. With more than a month before California Democrats choose the next leader of their state party next month, debating and jostling between candidates is becoming repetitive. This isn’t unexpected as Los Angeles County Democratic Party Chair Eric Bauman and Richmond’s Kimberly Ellis criss-cross the state looking to gather the support of party convention delegates, while participating in a bevy of local debates across the state. 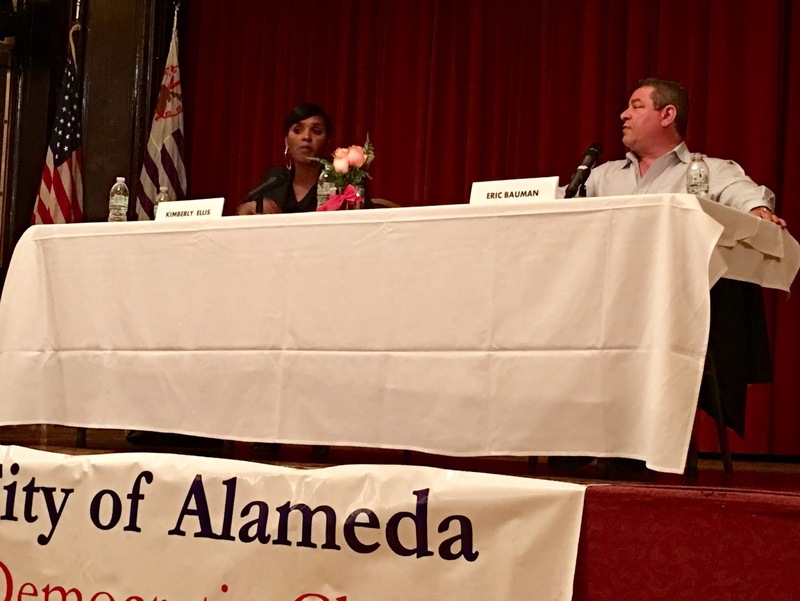 During a debate Wednesday in Alameda both candidates appeared exasperated with each others well-worn applause lines and political attacks. From the start, when Ellis delivered her opening statement, Bauman, rolled his eyes and pursed his lips in response to her reasons for running for party chair that included her contention that the state Democratic Party’s registration is flat while “No Party Preference” voters rise. When asked about the national party’s poor electoral performance, Ellis said, “We’ve been losing for a long time.” Ellis, herself, often displayed incredulous facial expressions in response to Bauman’s contention the state party is strong and without many of problems and fault lines afflicting the national party. But Ellis wants more, she said. “Now is not the time to rest on our laurels.” Despite the party’s electoral success, said Ellis, the legislature has not passed single-layer health care insurance, banned fracking, or reformed Proposition 13. “We haven’t had strong leadership at the top,” she said. Ellis’ candidacy is buoyed by a deep progressive surge among party faithful in many ways unleashed by Sen. Bernie Sanders’ run for president last year. So-called Berniecrats were highly successful last January in winning Assembly delegate races across the state. These are the same people who will help decide who replaces the retiring John Burton as the next leader of the state party at its convention May 20 in Sacramento. In the 18th Assembly District, which includes Alameda, Oakland and San Leandro, Berniecrats won every delegate seat despite not having the endorsement of its Assemblymember Rob Bonta. Not surprisingly, the City of Alameda Democratic Club voted, 36-12, on Wednesday night to endorse Ellis’ candidacy. Throughout the roughly 90-minute debate, it was Ellis who was often on the offensive. She charged the state party with being lax about attracting millennials into the fold. “We go to to millennials when we need their sweat equity, their money,” she said, and later added Bauman’s Los Angeles County had the lowest voter turnout in the entire state. Bauman disputed this, saying the entire party has grown under his leadership. Bauman said he would not only engage the party’s Young Democrats, but invite them to the “grown-up table.” Bauman said in the past party leaders urged the creation of Young Democratic clubs not to bolster their strength within the party, but to marginalize them to outside its power structure. Ellis also lodged a forceful attack on Bauman’s ties to Big Phrma. She again urged him to reveal his ties to a consulting work work he performed for Big Phrma last year that opposed Proposition 61, an initiative strongly backed by Bernie Sanders that would have lowered prescription drug prices in California. Copies of his consulting firm’s campaign finance report were placed on every seat at Wednesday night’s debate. But, Bauman, sdestepped the call by Ellis to acknowledge his ties to corporate money, saying his campaign committee finance reports from the last 10 years are publicly available on the Federal Election Commission’s website. Bauman called Ellis’ assertion “fallacious.” ” You can see there’s no oil, no pharma or tobacco,” he said. Posted in Alameda, Alameda Democratic Club, California Democratic Party, Democratic Convention, endorsement, Eric Bauman, jungle primary, Kimberly Ellis, milennials, Young Democrats. Bookmark the permalink. Right now the DP has such a huge advantage in California, that therefore over the next few years it would most likely continue to win elections in California, and no matter who was its head. However California's DP will eventually be done in by a few things, and including overconfidence, so it will not continue winning elections forever, and no matter how invincible it looks right now. And as far as the “battle” over issues, strategy, and the future direction of the DP that Bauman and Ellis are debating and engaging in, most likely that is just a big charade, since I think the real battle is over which group will have the power, in other words the Southern California Democrats, and who are headquartered in the Los Angeles area, or the Northern California Democrats, and who are headquartered in the Bay area. However since in California over the next few years the DP will most likely continue to win elections, and regardless of who is its head, in other words Bauman or Ellis or even Donald Duck or Mickey Mouse, the real and bigger issue is how much of a public circus and clown show California's DP can put on so as to destroy, and on a national basis, the credibility of the DP everywhere except in California, Washington DC, and possibly also in New York City. So come on California Democrats – Ready, On Your Mark, Get Set, LET'S DEMAGOGUE THE ISSUES SOME MORE.